Twelve miles off U.S. Highway 89 near Kanab, lies the wide-sweeping expanse of Coral Pink Sand Dunes State Park. 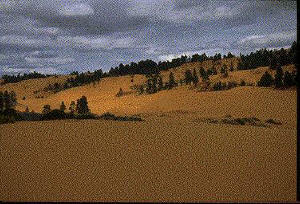 It is a wonderful place for riding off-highway vehicles, taking photographs or just playing in the sand. The park has a 22 unit pull-through campground, modern rest rooms, showers, waste disposal station and blacktop roads.